CEO Mark Zuckerberg has answered the calls of hermits and the anti-social with the launch of Facebook Spaces at the F8 developer event, meaning you no longer have to leave the house to interact with people ‘face-to-face’. The launch of the app creates an interactive environment, where up four people can ‘hangout’ irrelevant as to where they are located. While the initial appeal will be for agoraphobics and the chronically sedentary, the app also incorporates various other features including 360 videos and photos, reliving memories from your timeline and also content from people and pages followed by the user. It’s an advertisers wet-dream, as to date there have been few places to effectively distribute VR content. The team has also announced its Camera Effects Platform which will form the basis of the wider augmented reality dream moving forward. An army of outside developers will be tempted into creating new experiences for users from frames that can be used as profile picture frames or masks, scripted effects, animated frames and other AR technologies that react to movement, the environment or interactions during Live videos. Zuckerberg highlighted the platform itself will “form the technological foundations of advanced artificial intelligence” which will offer the opportunity to create much more engaging AR and VR experiences moving forward. 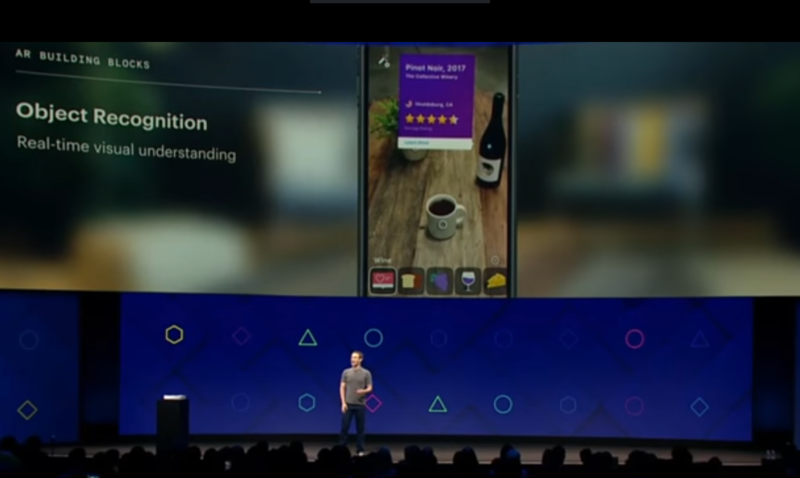 “We also have some of the best computer vision and object recognition work that will help you identify different things in the scene to help you put on relevant effects,” said Zuckerberg in his keynote. “You could tap on the plant and add flowers that are blooming, or water the plant with a raincloud. You could also tap on the wine bottle and you could add an information card that shares what the vintage of the wine is, and what the rating is or where to get it, and maybe in the future click to buy it. As with everything Zuckerberg gets involved in, there’s a chance to make some cash. Facebook is focusing on three technological building blocks for creating AR; precise location, 3D effects and object recognition. All of which can be monetized in some fashion. 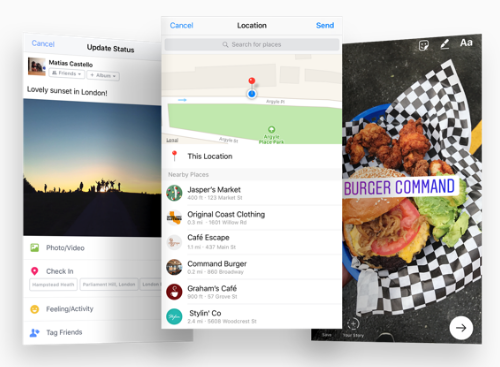 Another interesting new feature is Places Graph, which appears to be an online library of places of interest (tourist attractions), as well as bars and restaurants etc. The product itself looks remarkably similar to that of Lonely Planet or Trip Advisor, both of which have made successful businesses out of crowdsourcing information on locations and creating an online catalogue for the masses. This is just another example of Facebook creating a new opportunity for itself. Facebook may have started as an online platform to connect with friends and family, but it is fast becoming a community marketplace which offers everything you need. Its fighting competitors and traditional market incumbents on multiple fronts and looks to be doing quite a good job. It has already disrupted a number of verticals, and the list continues to grow month by month. The world of news and media has been fundamentally changed by the way news is distributed on the platform. Online directories are relatively redundant as a huge number of small and large businesses advertise on Facebook. Messenger and other OTT offerings have attacked SMS revenues for telcos, while video calling has crippled the voice avenue. Facebook Live is changing the video game and Workplace by Facebook is having a go at enterprise collaboration. Facebook’s initial purpose may have been quite simple, but Zuckerberg’s subsequent ambitions are anything but. Some may question whether Facebook is as disruptive as companies such as Google, but the difference here is the element of choice. Google is influential because it is the default search engine for a huge number of people and therefore has a ‘forced’ captive audience. Facebook is influential because approximately 1.23 billion monthly active users log-on by choice. They proactively create profiles and choose to upload information, videos or photos. Choice is key and arguably makes the audience more engaged, and therefore Facebook ever so more dangerous. What is clear is that Facebook is the master at playing the long-game. It was founded in 2004 and has spent years cultivated its users. Yes, the team has made a shed-load of cash through advertising, but now it has a captive audience which is fully invested in the Facebook proposition and we’re starting the see some serious diversification. As with any other business, there is a risk of over-diversification and loosing track of the core business. But the Facebook team seem happy to stand back from the innovation game, avoiding the risk of testing out new ideas. The vast majority of new features released by Facebook over the last few months have been imitations of competitor brands. It wouldn’t be known as innovative, but it is efficient, effective and ruthless. After all, it is ultimately irrelevant who does something first, it only matters who does it the best. Facebook might already be one of the most lucrative businesses on the planet, but the new avenues its heading down are showing some serious opportunities to make even more coinage. And it doesn’t look like any verticals are going to be safe from the Zuckerberg money train.